Economic map of Niger (1969). Peanut cultivation areas in purple, Rice in green, The remainder of agricultural land in orange. The northern limits of seasonal livestock forage is in brown. Niger's economy is based largely on subsistence crops, livestock, and some of the world's largest uranium deposits. Drought cycles, desertification, a 3.4% population growth rate and the drop in world demand for uranium have undercut an already marginal economy. Traditional subsistence farming, herding, small trading, and informal markets dominate an economy that generates few formal sector jobs. Between 1988 and 1995 28% to 30% of the total economy of Niger was in the unregulated Informal sector, including small and even large scale rural and urban production, transport and services. Current GDP per capita of Niger grew 10% in the 1960s. But this proved unsustainable and it consequently shrank by 27% in the 1980s and a further 48% in the 1990s. Much of this GDP is explained through the exploitation of uranium at Arlit in the far north of the country. Ore is partially processed on site by foreign mining corporations and transported by truck to Benin. Fluctuation of GDP can be mapped to changes in international uranium price, as well as price negations with the main mining company, France's Orano Cycle. Price rises in the mid-1970s were followed by a collapse in the market price through much of the 1980s and 1990s. Thus the GDP per capita has little direct impact on the average Nigerien, although uranium funds much government operation. The 2006 Human Development Index ranked Niger sixth from worst in the world, with a HDI of 0.370: 174 of 179 nations. Map and growing season for the Nigerien Sorghum crop. Chart shows Normalized Difference Vegetation Index against Long Rains Dry Season (July – February), measuring normal years crop growth in the major Sorghum producing areas of Niger. Map and growing season for the Nigerien Rice crop. Chart shows Normalized Difference Vegetation Index against Long Rains Dry Season (July – Feb), measuring normal years crop growth in the major Rice producing areas of Niger. Niger's agricultural and livestock sectors are the mainstay of all but 18% of the population. Fourteen percent of Niger's GDP is generated by livestock production (camels, goats, sheep and cattle), said to support 29% of the population. The 15% of Niger's land that is arable is found mainly along its southern border with Nigeria. Rainfall varies and when insufficient, Niger has difficulty feeding its population and must rely on grain purchases and food aid to meet food requirements. Although the rains in 2000 were not good, those in 2001 were plentiful and well distributed. Pearl millet, sorghum, and cassava are Niger's principal rain-fed subsistence crops. Irrigated rice for internal consumption, while expensive, has, since the devaluation of the CFA franc, sold for below the price of imported rice, encouraging additional production. Cowpeas and onions are grown for commercial export, as are small quantities of garlic, peppers, potatoes, and wheat. Groundnuts, and to a lesser degree Cotton, introduced by former colonial power France in the 1930s and 1950s respectively, account for most of the world market for Nigerien industrial agriculture. Prior to the mass exploitation of uranium in the early 1970s, groundnut oil was the largest Nigerien export by worth. The majority of Niger's population are rural residents engaged in agriculture, mostly in the south centre and south west of the nation. While these people are dependent on the agricultural market portions of their production and consumption, much of Nigerien farming is subsistence agriculture outside of the marketplace. Graphical depiction of Niger's product exports in 28 color-coded categories. Of Niger's exports, foreign exchange earnings from livestock, although impossible to quantify, are second only to those from uranium. Actual exports far exceed official statistics, which often fail to detect large herds of animals informally crossing into Nigeria. Some hides and skins are exported and some are transformed into handicrafts. The persistent uranium price slump has brought lower revenues for Niger's uranium sector, although uranium still provides 72% of national export proceeds. The nation enjoyed substantial export earnings and rapid economic growth during the 1960s and 1970s after the opening of two large uranium mines near the northern town of Arlit. When the uranium-led boom ended in the early 1980s, however, the economy stagnated and new investment since then has been limited. Niger's two uranium mines (SOMAIR's open pit mine and COMINAK's underground mine) are owned by a French-led consortium and operated by French interests. The open pit COMINAK uranium mine at Arlit. Exploitable deposits of gold are known to exist in Niger in the region between the Niger River and the border with Burkina Faso. Substantial deposits of phosphates, coal, iron, limestone, and gypsum also have been found. Numerous foreign companies, including American firms, have taken out exploration licenses for concessions in the gold seam in western Niger, which also contains deposits of other minerals. Several oil companies explored for petroleum since 1992 in the Djado plateau in north-eastern Niger and the Agadem basin, north of Lake Chad but made no discoveries worth developing at the time. In June 2007, however, China National Petroleum Corporation (state-owned by the People's Republic of China) signed a US$5 billion agreement to extract oil in the Agadem block, as well as build a 20,000 barrels (3,200 m3) per day oil refinery and a 2,000 km oil pipeline in the country; production is expected to start in 2009. Niger's known coal reserves, with low energy and high ash content, cannot compete against higher quality coal on the world market. However, the parastatal SONICHAR (Société nigérienne de charbon) in Tchirozerine (north of Agadez) extracts coal from an open pit and fuels an electricity generating plant that supplies energy to the uranium mines. A test Oil well in the Tenere Desert, January 2008. After the economic competitiveness created by the January 1994 CFA franc devaluation contributed to an annual average economic growth of 3.5% throughout the mid-1990s, the economy stagnated due the sharp reduction in foreign aid in 1999, which gradually resumed in 2000, and poor rains in 2000. Reflecting the importance of the agricultural sector, the return of good rains was the primary factor underlying a projected growth of 4.5% for 2001. In recent years, the Government of Niger promulgated revisions to the investment code (1997 and 2000), petroleum code (1992), and mining code (1993), all with attractive terms for investors. The present government actively seeks foreign private investment and considers it key to restoring economic growth and development. With the assistance of the United Nations Development Programme (UNDP), it has undertaken a concerted effort to revitalize the sector. Niger shares a common currency, the CFA franc, and a common central bank, the Central Bank of West African States (BCEAO), with six other members of the West African Monetary Union. The Treasury of the Government of France supplements the BCEAO's international reserves in order to maintain a fixed rate of 100 CFA (Communauté Financière Africaine) to the French franc (to the euro as of January 1, 2002). In January 2000, Niger's newly elected government inherited serious financial and economic problems including a virtually empty treasury, past-due salaries (11 months of arrears) and scholarship payments, increased debt, reduced revenue performance, and lower public investment. In December 2000, Niger qualified for enhanced debt relief under the International Monetary Fund program for Highly Indebted Poor Countries and concluded an agreement with the Fund on a Poverty Reduction and Growth Facility (PRGF). In addition to changes in the budgetary process and public finances, the new government has pursued economic restructuring towards the IMF promoted privatization model. This has included the privatization of water distribution and telecommunications and the removal of price protections for petroleum products, allowing prices to be set by world market prices. Further privatizations of public enterprises are in the works. 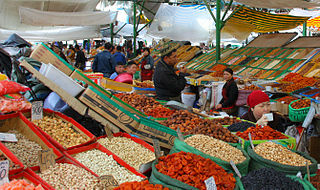 In its effort comply with the IMF's Poverty Reduction and Growth Facility plan, the government also is taking actions to reduce corruption and, as the result of a participatory process encompassing civil society, has devised a Poverty Reduction Strategy Plan that focuses on improving health, primary education, rural infrastructure, and judicial restructuring. The most important donors in Niger are France, the European Union, the World Bank, the IMF and other United Nations agencies (UNDP, UNICEF, FAO, WFP, and UNFPA). Other principal donors include the United States, Belgium, Germany, Switzerland, Canada, and Saudi Arabia. While USAID does not have an office in Niger, the United States is a major donor, contributing nearly $10 million each year to Niger's development. The U.S. also is a major partner in policy coordination in such areas as food security and HIV/AIDS. The importance of external support for Niger's development is demonstrated by the fact that about 45% of the government's FY 2002 budget, including 80% of its capital budget, derives from donor resources. In 2005 the UN drew attention to the increased need for foreign aid given severe problems with drought and locusts resulting in a famine endangering the lives around a million people. This is a chart of trend of gross domestic product of Niger at market prices estimated by the International Monetary Fund with figures in millions of CFA Francs. Mean wages were $0.37 per man-hour in 2008. (PPP) 3.10 bil. 3.51 bil. 4.64 bil. 4.94 bil. 6.29 bil. 9.25 bil. 10.09 bil. 10.69 bil. 11.95 bil. 11.96 bil. 13.11 bil. 13.68 bil. 15.58 bil. 16.67 bil. 18.24 bil. 19.17 bil. 20.39 bil. 21.84 bil. The fertile south of Niger near the Niger River. Drought has turned farmland into useless soil. A farmer examines the soil in drought-stricken Niger during the 2005 famine. The Niger mining industry is the main source of national exports, of which uranium is the largest export. Niger has been a uranium exporter since the 1960s and has had substantial export earnings and rapid economic growth during the 1960s and 1970s. The persistent uranium price slump has brought lower revenues for Niger's uranium sector, although it still provides 72% of national export proceeds. When the uranium-led boom ended in the early 1980s the economy stagnated, and new investment since then has been limited. Niger's two uranium mines—SOMAIR's open pit mine and COMINAK's underground mine—are owned by a French-led consortium and operated by French company Orano. A farmer collecting millet in Koremairwa village in the Dosso department. A rural mother tends to her malnourished infant at the Maradi MSF aid centre, during the 2005–2006 Niger food crisis. While the Maradi Region is the breadbasket of Niger, the 20th century saw three severe Sahel droughts which brought dramatic food insecurity to even the most fertile regions of Niger. Niger has insufficient access to the energy it needs. The country's energy consumption is considered one of the lowest in the world. Niger's existing systems of energy consumption are also very underdeveloped to sustain energy efficiency within the state. Electricity access between urban areas such as Niamey enable 50 percent electricity service, and rural areas with 20 to 40 percent electricity service, with a region at its low of 10 percent electricity service. Other demands for electricity are met by NIGELEC, providing Diesel generator and thermal coal plants to create fuel for rent. Niger has three major energy consumption outlets; oil products, biofuel and waste, and electricity. As of 2016, Niger's energy consumption includes 486 ktoe via oil products, 2,217 ktoe via biofuel and waste, and 84 ktoe via electricity. Niger's dominate source of energy includes wood and charcoal, also known as biomass. Out of the 2,747 ktoe of energy supply in the country, 70% of it is from biomass. Households use up to 90% of biomass because of the lack of modern energy available, and the increased rates of imported energy that some cannot afford. The oil products predominately used are liquiefied patroleum gas, motor gasoline, gas and diesel, other kerosene, and fuel oil. A chart representing the total final consumption of Niger's energy sources. Niger also gets partial access from hydro electirc power from dams created alongside the Niger River. Hydro electric power contributes about 280 MW to Niger's energy collectively from several hydropower sources, this includes 130 MW from the Kandadji, 122.5 from River Niger in Gambou, and 26 MW from Dyondyonga in Mekrou. Getting renewable energy via hydropower has had contriversial arguments due to the importance of rainfall in acquiring energy. Again, these hydro electric power dams are creating energy for Niger via Nigeria. Solar energy has also been used to provide energy access. From 2004 to 2010 solar power generation was implemented, but there was a significant drop from 2010 to 2012. However, since 2016 approximately 5 Gwh of solar power was used. Niger has potential to provide sustainable and renewable energy access within the country, which will help increase its energy intake and work with the growing demands of the population. Several projects have been discussed to bring solar power, hydropower, grid power, and wind power in works to create clean energy. Many NGOs are working on funding projects to provide sustainable and renewable energy in parts of Africa. Affording the resources to create sustainable energy is one of the biggest barrier Niger faces, but agencies such as International Renewable Energy Agency (IRENA) and AbuDhabi Fund for Development (ADFD) are funding low developing countries, including Niger, to help develop local renewable projects. Theses agencies will support projects including a hybrid micro-grid project emploting solar PV and advanced lithium-ion batteries, a hydropower project, integrated wind and solar, and a combination project consisting of micro-grid and solar home kits. In addition, Lighting Africa, an NGO primarily working in Niger, is assisting in sustainable energy development through two World Bank-sponsored Energy Access Projects: the Niger Solar Electricity Project (NESAP), and the Regional Off-Grid Electrification Project (ROGEP). These projects will work with grid systems in two piloting countries, and this includes Niger. They will aim to increase electricity access in households, businesses, and communities through modern off-grid electrification. ^ "World Bank forecasts for Niger, June 2018 (p. 153)" (PDF). World Bank. Retrieved 6 September 2018. ^ a b c d e f g h i j k l m n o p "Niger". The World Factbook. Retrieved 2018-05-07. ^ "Ease of Doing Business in Niger". Doingbusiness.org. Retrieved 2017-01-25. ^ C. Maldonado & J. Gasarian. SECTEUR INFORMEL: FONCTIONS MACRO-ECONOMIQUES ET POLITIQUES GOUVERNEMENTALES: LE CAS DU NIGER. Document de recherche S-INF-1-20. Département du développement des entreprises et des coopératives, Organisation internationale du Travail – OIT (1998). ^ Human Development Report 2007/2008. United Nations Development Program. ^ a b c Decalo, Samuel (1997). Historical Dictionary of the Niger (3rd ed.). Boston & Folkestone: Scarecrow Press. ISBN 0-8108-3136-8. ^ "Niger set to become oil producer". BBC News. 2007-06-03. Retrieved 2008-06-07. ^ a b c d e f g Background Notes for Niger: January 2009 Bureau of African Affairs, United States State Department. Retrieved 26 February 2009. Portions of the "Economy" section are here used verbatim, as this document is in the public domain. ^ a b Bio-reclamation – Converting degraded lateritic soils into productive land, Rural 21, March 2013. ^ "Kandadji" Ecosystems Regeneration and Niger Valley Development Programme (KERNVDP), Detailed Population Resettlement Plan, Executive Summary, Republic of Niger, Prime Minister's Office, High Commission for Niger Valley / African Development Bank, February 2008, p. 3-4. ^ When Endemic Malnutrition is Labeled as Famine. Eden Foundation (Sweden), May 2006. ^ a b "UPDATE 3-Areva signs uranium deal with Niger, delays new mine". Reuters. Retrieved 7 February 2015. ^ a b "Niger sets new terms in uranium ore deal with Areva". DW.DE. Retrieved 7 February 2015. ^ "– Coal Production and Utilization 2007–2011 Report P218" (PDF). ^ a b (in French) "Le Petrole Nigerien: D'Agadem a la Soraz". Archived from the original on 14 July 2014. Retrieved 29 June 2014. ^ As refinery opens, Niger joins club of oil producers, Agence France-Presse. 28 November 2011. ^ Niger: Agricultural trade liberalization and women’s rights. August 2006. Report by 3D – Trade – Human Rights – Equitable Economy. ^ a b "EZ Proxy | California State University, Long Beach". login.csulb.idm.oclc.org. Retrieved 2018-12-06. ^ a b Gado, Salifou (2015). "The Energy Sector of Niger: Perspectives and Opportunities" (PDF). energycharter.org. ^ a b c "Statistics". www.iea.org. Retrieved 2018-11-03. ^ a b "EZ Proxy | California State University, Long Beach". csulb.idm.oclc.org. Retrieved 2018-11-03. OECD/ AEO 2007 Niger country study. Invest in Niger: Centre de Promotion des Investissements Sis à la Chambre de Commerce d'Agriculture, d'Industrie et d'Atisanat du Niger. http://www.niger-tourisme.com: Ministère du tourisme et de l'artisanat nigérien. The MBendi website, Niger: A South Africa-based business research group. Is especially useful for tracking government mining concessions. LA MAISON DE L'AFRIQUE: Niger. Franco-African business group. Institut de Recherche pour le Développement au Niger: French government development office in Niger. United Kingdom Department of International Development:Niger. World Trade Organization MEMBER INFORMATION: Niger. The World Bank, Niger overview and resources. International Monetary Fund: Article IV Executive Board Consultation reports regarding Niger. IMF. Niger: Financial Position in the Fund as of January 31, 2008. IMF. Niger: Transactions with the Fund from May 01, 1984 to January 31, 2008. Estruscan Mining (Canada): corporate report on their Samira Hill Gold Mine, on the Benin border. Agriculture is the primary economic activity of a majority of Niger's 17 million citizens.